Patience Cavanaugh is not a typical woman. After losing the man she wanted to marry, she inherits her grandmother’s run-down boarding house in the West. Moving away from all she knows and her mother’s critical eye, Patience is determined to make the boarding house successful again. After cleaning what she can, she still has many repairs to do but is ill-equipped to handle them alone. The new Marshall in town, Jedediah Jones, comes up with a simple arrangement that should be mutually beneficial. Patience would cook food for Jed and his posse and any prisoners while Jed would help her out with repairs. Although Patience and Jed didn’t meet on the best terms, the attraction between them is undeniable. While Patience still struggles with the tragic death of her beau, Jed’s secret might be the one thing that keeps their relationship from blossoming. Will Patience ever realize she is beautiful and is Jed the one to convince her? Can Jed learn to trust his heart with another woman? Can the two of them uncover the truth about the trouble that’s been brewing in town? 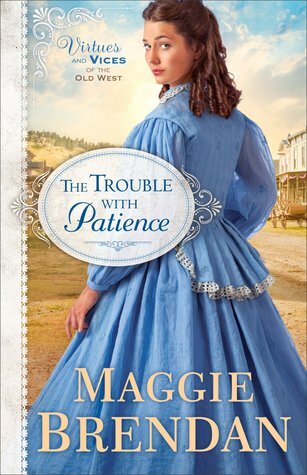 I really enjoyed this story about Patience and Jed because the story was very easy to read and fun. The banter between the two of them is fresh and thoroughly entertaining. Patience is a really strong woman who can’t see how beautiful she is. She treats those around her with respect and mercy; she’s definitely someone worth emulating. Jed is full of regrets from his past, which is something that everyone can relate to. The character development is beautifully done, but the pacing at the end is a little rushed in my opinion. I recommend this book to anyone who enjoys historical romance with good character development.